I really want to have a week off from my life so that I could write all the blog posts that are in my head and on various lists around my desk. I'm afraid that by the time I get to all the topics I want to post about, they'll be old news -- and my list will just keep getting long in the meantime. Office party: Took the kids to my husband's office Friday afternoon for trick-or-treating (see photo). You know, because you need to start two days before Halloween to ensure that your kids are appropriately hopped up on sugar ALL weekend. Climb for Life: Husband is running up 56 flights of stairs on Saturday morning to raise money for the Cystic Fibrosis Foundation. We'll be cheering from the ground floor. You can make a donation here if you like. NC Symphony: I won tickets from The B Keeps Us Honest for the kids series (yea! ), so all four of us get to go to the concert mid-day on Saturday. They're also having an instrument petting zoo before the concert and a costume parade at the end -- Junius can't wait to check out the trombone in his Batman outfit. Spooky Trail: Our neighborhood pool puts on a "haunted walk" around the pool grounds, with a little kid-friendly version in the late afternoon on Saturday. I love that Pippi calls it the "Pooky Trail" because she can't say the s-consonant combination sounds. She loves that they're selling hot dogs. Halloween Parade: The second-annual neighborhood friends parade takes place Sunday afternoon. Will probably involve 50 children under the age of 10, which likely sounds more terrifying than the Spooky Trail to some of you. Oh, and it's 11:15 and I'm writing this instead of going to bed like any sane person would do. So how about you -- what's keeping you busy this weekend? If you need a lovely dish to take to an ECU Pirates dinner or a Northwestern Wildcats party, have I got the recipe for you: Roasted purple sweet potato risotto. Actually, the recipe called for regular NC sweet potatoes -- I found it in a deck of recipe cards courtesy of the NC Sweet Potato Commission.What, you didn't know North Carolina has a Sweet Potato Commission? It is the state vegetable, after all. But anyway, I had all these purple sweet potatoes left from our Produce Box, so I just substituted them in. And WOW, is it purple. Also, quite tasty (despite the fact that my photo here makes it look like a dumped-out can of cat food) -- my husband even had seconds. And, did I mention it's very, very purple? Here's the recipe, with my usual amendments. Will probably try it again with orange sweet potatoes to see if it changes the taste or just the color. Preheat over to 350. Peel sweet potatoes and cut in half. Cut half of the sweet potatoes into 1/4-inch dices and set aside. Cut the remaining sweet potatoes into 1-inch chunks and toss with 1 tbsp olive oil. Roast until soft, about 30 minutes. Puree in a food processor with 1/4 cup vegetable stock; reserve. In a large saucepan, heat remaining 3 tbsp oil and sauté onion and 1/4-inch diced sweet potatoes over medium-high heat. Cook about 3 minutes until softened but not browned. Add garlic and arborio rice and cook 2-3 minutes, stirring frequently. Stir in wine and cook, stirring until completely absorbed. In the same manner, add hot stock, 1/2 cup at a time, stirring until each addition is completely absorbed and stock is use up. Add sweet potato puree, rosemary, thyme, butter and Parmesan. Season to taste with salt and pepper. Let me know what you think if you try it out. Or, if you have a favorite sweet potato recipe, add it here in the comments. We took the kids to the N.C. State Fair yesterday -- it was their first trip and they were jumping out of their skins from excitement. As this was only my second trip to the Fair and the first time with kids, I learned a lot from the experience. A trip to the Fair is a lot of fun, but it's also some serious work for the parents. Here are five lessons from the day. Bring a stroller. Even though Pippi never uses a stroller anymore (unless I'm trying to exercise when she's home), I realized too late that we should have brought one with us. My arms are still aching from carrying her30 pounds of fabulousness to the fairgrounds, around the event and back to the car. A footlong hot dog is not too big. At least, not for one five-year-old Junius. Kid barely stopped to talk between bites because he was enjoying it so much. Seriously, just look at how happy he was. A map counts as a prize. Junius was very excited to have his own copy of the Fair map. Probably even more excited than he was about the Nemo look-alike he got from one of the fishing games. And it was free. Look for friends. Even with thousands of people streaming through the gates each day, it's still possible to run into someone you know. We ran into friends from our neighborhood and didn't even know they would be at the Fair. And while you're watching out for friends, you can enjoy the people watching. Because there are some crazy-looking interesting people out there. Don't be afraid of the kid rides. And I mean that advice to the mommies. I was very hesitant about letting the kids get on the tiny roller coaster (and by coaster, I mean a little dragon train that goes up and down around the circle), but they LOVED it. Was totally worth it to watch them cracking up and yelling around the curves together. And one bonus tip for watching the fireworks: Before we actually went to the Fair yesterday, Junius and his Daddy watched the fireworks show on Tuesday night. Because Juni isn't really old enough to stay up until 10:00 at the Fair, the two of them drove to a nearby (free) parking lot around 9:30, put the top down, enjoyed a milkshake, and watched the show from outside the Fairgrounds. So how about you -- what's your best tip for going to the Fair? the entrance to Crabtree Valley Mall this week. This, the third week of frickin OCTOBER.. Step 1: Build a large wooden sandbox in your backyard. Step 2: Cover the sandbox with a heavy duty tarp to keep the neighborhood cats out. Hook the tarp onto the sides of the sandbox, using a staple gun along one side and small hooks on the other sides. Step 3: Wait for Noah's rain to fall. Please be aware of two caveats to today's strategery: 1) we did not do this on purpose and 2) it's probably not really the best approach if you're actually going to do step 4. But it still made us laugh. One of my favorite ways to cook is to fix one thing and make it last through as many meals as possible. That's the beauty of cooking pork tenderloin -- there are so many ways to serve it that are easy to prep, once you've done the initial cooking. Whenever Harris Teeter has the Smithfield pork tenderloin on sale, I usually buy one and keep it in the freezer until I'm ready. They tend to be close to 3 lbs (because they actually put two in a package), so it's way more than we can eat in one or two meals. Thanks to tips from my friend Ms. S, I've come up with five different meals from one package of tenderloin. Pork tenderloin with veggies: For the first meal, I cook the tenderloin in the oven (according to package directions) -- sometimes I marinade, sometimes not. Here's a good recipe (and a borrowed photo above) I found online. Slice and serve with whatever veggies you like best -- we often use broccoli and mashed potatoes. BBQ pork pizza: Get a ready-made pizza crust or the great pizza dough at Trader Joe's (near the cheese section). Use BBQ sauce instead of tomato sauce. Chop up or shred some of the pork and layer on top with some red onion (you can cook them a little to carmelize if you like) and shredded Italian cheeses. Pork and peach salad: Use your favorite mixed greens. Add slices of pork along with peaches (I like to warm them a little first), walnuts, cranberries and feta cheese. Toss with a little vinaigrette. Pork and black bean burritos: Whatever your preferred ingredients are for burritos, use the same approach. Here's a good recipe -- just add pork. BBQ pork sandwiches: The key to this very simple meal is to get nice, soft sourdough bread (I like Pepperidge Farm) and some smoky gouda or muenster or provolone cheese. Toast the bread, layer with pork, BBQ sauce and cheese, then let it get warm and melty under the broiler. 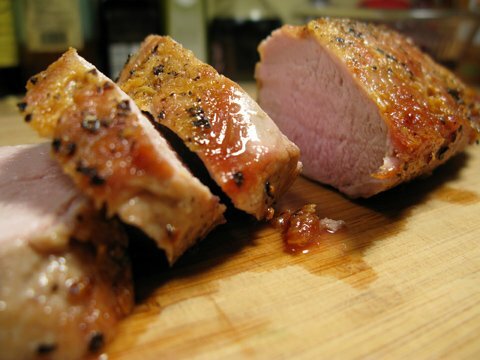 What's your favorite way to serve pork tenderloin? Or better yet, what's your favorite item to cook once and serve all week? It was a rough morning over at Chez Convertible today. Not worth explaining the details (except to accept my share of responsibility for the mess), but let's just say I was feeling a little beaten down by the time I got in the car to drive to work. I switched on NPR as I turned out of the driveway, hoping to distract myself with the morning's news. After a story on the Chilean miners rescue and another about people losing their jobs and homes in the Gulf, I was starting to get my life back into perspective. I mean really, what's one bumpy morning compared to people who are really struggling to stay alive or buy food for their families? And then, just as I was pulling myself together, BAM! C'mon, NPR. It's not nice to kick a girl when she's down -- and then ask her for money, too. For the record, I love NPR. I just really hate the pledge drive. "The creation of the world's first system of universal public education...is one of the great achievements of American democracy. It embodies a faith in the capabilities of ordinary people that the Founders simply didn't have. It is also, like democracy itself, loose, shaggy, and inefficient, full of redundancies and conflicting goals. It serves many constituencies and interest groups, each of which, in the manner of the parable of the blind men and the elephant, sees its purpose differently. But by the fundamental test of attractiveness to students and their families, the system--which is one of the world's most ethnically diverse and decentralized--is, as a whole, succeeding." As I read this article, which goes on to discuss the need for measured, research-based solutions to the very real challenges in public education rather than take a "Noah's Ark" approach in which we wash everything away and start anew, I kept thinking that Lemann must have been writing about Wake County. Except that nowhere in his article does he call anyone a prom queen. At last week's school board meeting, the majority's 5-4 voting alliance splintered into name-calling and snide remarks as Debra Goldman (along with the four members who have been in the minority since December) put the brakes on a train-wreck of a "plan" (and I use that term loosely) for student assignment in Wake County. While I'm relieved that the board's decide-now-ask-questions-later, destructionist approach to "planning" is on hold, I have no confidence in Goldman or the rest of the former Gang of Five. What amazed me most about all of this drama is how apparently shocked and surprised these five board members are to discover that creating a student assignment plan is hard. Really?! Did you think that the people in those seats before you weren't trying? Or that maybe they delighted in screwing with families and students to see how much hate mail they could generate? Or that somehow they were just oblivious to the challenges facing our schools? The truth is that, as Nicholas Lemann observed in his article, public education is complicated. Every parent rightfully wants what's best for his or her own child -- but our public schools have to serve ALL children. And what's best for one child or one family might not be the right answer for another. If there were a simple solution to student assignment in Wake County -- one that sent every family to their closest school filled with magnet offerings while staying within county budgets and ensuring that every school fostered a healthy, effective (uncrowded) environment for teaching and learning -- don't you think someone would have tried it by now? There is no simple solution. Believe me, I wish I had one to offer. I only know that this "Noah's Ark" approach of throwing out the old plan and bull-dozing ahead without research or data to support the new plan isn't going to help more students graduate with the skills they need for college and careers. And petty commentary between board members certainly won't help my son and his classmates learn how to read. It's time for the school board to move beyond campaign rhetoric, roll up their sleeves and get to work on the business of setting policies that help students learn. Ms. Goldman, I hope you'll prove me wrong for doubting your intentions and take the lead on making a positive difference for all 143,289 of them. PS - If you missed the photo gallery of the one-minute post-meeting Goldman-Tedesco chat, you absolutely must check it out. Add your own voice-over captions for entertainment. And yes, Tedesco really did publicly call Goldman a prom queen. She has reportedly denied ever having been one. Today, while doing laundry, I found four hardened kernels of corn at the bottom of my washing machine. Under normal circumstances, that might seem strange -- but we spent last Saturday at Hill Ridge Farms, so I actually knew where they came from. Apparently when you let your kids play in a huge sandbox filed with corn instead of sand, they're likely to bring some of it home in their pants. They're also likely to have an absolute blast. Despite other people's recommendations, I've always been a little skeptical about the hayride-pumpkinpatch-cornmaze-farmanimals events that get publicized each fall -- just sounded itchy, smelly and cold. But some friends invited us to join them and the weather was perfect, so I agreed to go along. As it turned out, I couldn't have hoped for a better day. From the moment we turned off Tarboro Road in Youngsville, the staff at Hill Ridge Farm was friendly, organized and attentive. We had an easy time in the parking lot, quickly got our tickets and were inside playing without any trouble (think Caniac Carnival, not that other family outing). We even arrived early enough to get in our train ride and hayride without waiting in line. At $10 per ticket, it's not a cheap outing -- but each ticket gets to take home a pumpkin, so it's not a bad deal either. Plus I didn't feel as guilty about taking pictures while my kids wandered around the pumpkins as I do when we're pumpkin shopping at the farmer's market. After all that playing and pumpkin-picking, we needed a break and a snack. Pippi begged for kettle corn -- and again I was suspicious, as I'm a traditional movie-theater popcorn kind of girl. But oh-my-delicious-freshly-popped-sweet-and-salty-goodness, I take it all back. The suspicion, that is, not the kettle corn. Because we ate it all. And we didn't feed any of it to the animals, even when they tried showing us their most clever tricks. Because the signs say not to share people food with the animals, and it was hard enough sharing it just among the four of us. The morning's big finish involved a slide built into a hill, complete with little burlap sack to help the ride along. In the not-too-distant past, Junius would have been too afraid to try this on his own, but here's my big boy now. Might have made me a little misty-eyed if he hadn't been having so much fun. All in all, it was a spectacular morning for the whole family, plus we all took glorious naps when we got back home. A perfect fall Saturday, if you ask me. Go early. Farm opens at 9 on Saturday -- be there. Wear sunscreen. It may be fall, but little faces still get sunburned on a pretty day. Buy the regular tickets plus one train ride. The super pass is more than you need (at least for little kids). Bring a picnic, if you want to save a little money. Plus, your kids may fall asleep on the ride home, so it's easier if they've already had lunch. One of the unfortunate ironies about blogging is that people with the best stories or the most interesting lives are often too busy living those lives to have time to write down any of those stories. So today, I bring you a guest post via an email from a friend who is a high school social studies teacher. For the purposes of this post, we'll call her Ms. T (so as not to get her fired because she's an excellent teacher and goodness knows we can't afford to lose her) -- otherwise, the story is relayed here (in italics) as she shared it. That he, and possibly his parents, thought this shirt was appropriate for school. That he got rude with and then yelled at the SRO [school resource officer, basically school police] who spoke with him about the shirt being appropriate after I sent the student to the office. So there you have it. And people wonder why teachers feel under-paid and under-respected. Note: When I did a Google search to see if I could find the shirt (available from Cafe Press), I also found a series of the same shirt with the breast cancer ribbon included in the background. I'd like to believe that this particular kid was just showing his support for breast cancer survivors, but somehow (call me cynical) I don't think that's really the statement he was trying to make. Admit it. You're curious, you've got questions, but you've been too polite (or just afraid) to ask. Who exactly is this person who thinks she's got so much to say and expects people to read it? Who is this Convertible Girl? Well, now thanks to Sue, you can get some answers. Author of Motherhood and Me, Sue invited me to participate in her regular feature called "Well, I Didn't Know That," where she interviews other bloggers. So head on over and check out Sue's interview with me on her blog. While you're there, be sure to leave Sue a comment and check out her other posts, then come back and let me know if you actually learned anything new and interesting about me. Go ahead, now. I'll wait. When I got home Sunday night, I had grand visions of posting something each day this week about my time at Type A Mom conference. Monday started off strong -- and that was the end of that. So now it's Friday, and I think I'll try to sum up a week's worth of never-got-written posts with a list of five things that made the conference worthwhile. Clearly, the best part of the weekend was the people. From famous bloggers to newbies, friends in real life to people I've only read online, it was a really interesting crowd. Those lovely ladies above all write from here in the Triangle, bloggers came to Asheville from all over the country. Much has been written this week about whether or not the "popular bloggers" were approachable or elitist (two of my favorite posts are from Jessica and Abby) -- personally, I found them all to be lovely, witty and kind. Thanks to the Mom Market, I got a head start on my Christmas shopping. And by head start, I mean that I picked up business cards so that I can do all my shopping on these ladies' websites. Trust me when I tell you that you want to check out Lemons with a Pea (and her hilarious blog), BabyPop Designs (what kid doesn't want a custom superhero cape and accessories? ), Sweet Sadie Marie (love all the little chalkboards), stringbean17 (creator of Pippi's adorable new backpack, which you'll just have to ask for because it's not on her etsy site), Studio Jewel (I'll take one of each, please) and Cranky Pants (two words: monster booty). Okay, let's be honest, the swag was fun. Came home with cool shopping bags, new running socks, a Disney clubhouse towel and notebook, tasty snacks and much much more. Oh, and (brace yourself), a Build-a-Bear. An actual, free, full-sized, snuggly soft Build-a-Bear. You know, because Maxine Clark is just that kind of awesome. Coming home. There's nothing like being away for a couple of days to make your family miss you -- and vice versa. My sweet husband sent text messages with photos during the weekend so I could see what the kids were up to. And the hugs I got (along with hand-made cards) when I arrived home were enough to power me through the crazy week ahead. So thanks to Kelby Carr and all the presenters, volunteers, sponsors and participants who helped make the weekend a success. Here's hoping I can live up to the potential. Photo by Canape's husband, featuring (L to R) Abby, Andrea, Fadra, me, Jessica, Marty (with her cutest accessory) and Sue.